In 1862 an American Egyptologist was far from the war that was engulfing America. In that year Edwin Smith bought a manuscript from an Egyptian collector in Luxor. A prolific collector of Ancient Egyptian manuscripts and finds, Smith was, apparently, never the less not the most gifted translator. He held onto the manuscript for more than forty five years, until his death in 1906 and in that time was not able to make substantial progress in translating the papyrus. At his death his daughter donated the papyrus, and other parts of her father’s collection, to the New York Historical Society. In 1920 the Historical Society brought on the famous Egyptologist James Breasted to translate the papyrus. His completed translation was published a decade later. 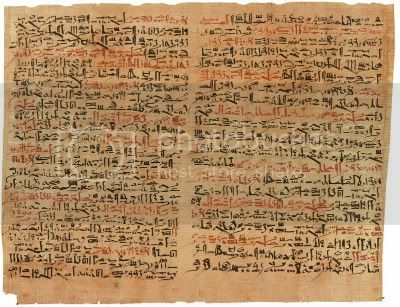 The papyrus is a medical textbook. Its clarity, conciseness and organization are remarkable for a medical treatise of the time. But perhaps even more impressive is its presentation of incredibly accurate physical examination and anatomical findings; along with rather reasonable treatment options. It is also the first real neuroanatomical study. The document is broken up into forty eight cases and is an incomplete copy of a previous work. Of the 48 cases, 27 deal with head trauma and another 6 with spinal trauma. In presenting these cases the papyrus is the oldest surviving document to describe the sulci and gyri on the surface of the brain, the meninges, and the cerebral spinal fluid. Consider the following Breasted translation of one of the cases. Title: Instructions concerning a smash in his skull under the skin of his head. Diagnosis: Thou shouldst account him one whom something entering from outside has smitten, as one who does not release the head of his shoul fork, and one who does not fall with his nails in the middle of his palm; while he discharges blood from both his nostrils (and) from both his ears, (and) he suffers with stiffness in his neck. An ailment not to be treated. Treatment: His treatment is sitting, until he [gains color], (and) until thou knowest he has reached the decisive point…. [The neurotrauma cases,] according to our present day terminology would be classified as follows: two compound linear fractures; four compound depressed fractures; four compound comminuted fractures; and one comminuted fracture without external wound. The symptoms and signs of head injury are given in considerable detail. Feeble pulse and fever are associated with hopeless injuries and deafness as well as aphasia are recognized in fractures of the temporal region. James Breasted attributed the original treatise to Imhotep, the “Father of Medicine.” Such attribution would put the original work (of which the Edwin Smith Papyrus is clearly a transcription of) a 1000 years earlier. That would mean that these description of the brain and its coverings and the cerebrospinal fluid and all these detailed examination findings were recorded more than 5000 years ago.